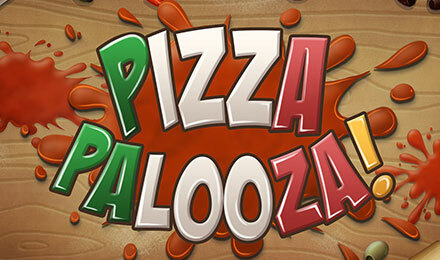 Play Pizza Palooza Slots at Moon Games Casino Today! Let’s take a trip to the traditional pizza parlour on Pizza Palooza! Benefit from Progressive Jackpots, Free Spins, Pick Me Bonuses and yummy symbols! It’s time for Pizza Palooza! Make sure you grab a snack before you play this game because you’ll surely get hungry! Enjoy this 5-reel slot game where you have to make a combination of three or more symbols in corresponding shapes you’ll find in the paytable. You can benefit from the FREE Spins feature, where it is triggered by having more than one combination on the reels. For Two Combos: 1 Free spin, Three Combos: 2 Free Spins and Four Combos: Three Free Spins. But that’s not all! You can trigger the Pick Me Bonus feature by landing pizza box symbols on reels one and five!